the scent of green bananas: slather me in sugar and cinnamon, then let's just call it a day. 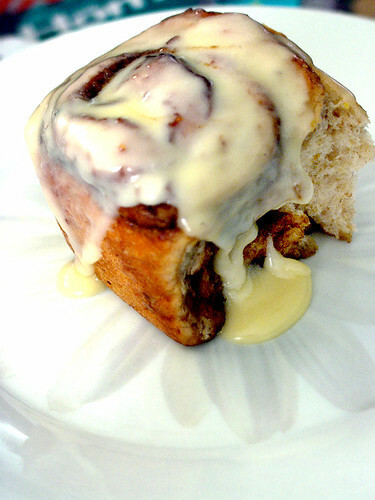 slather me in sugar and cinnamon, then let's just call it a day. remember that photo above? 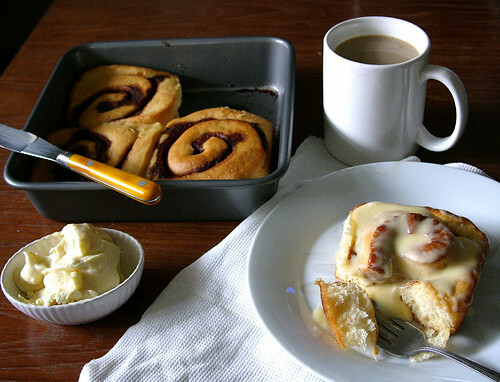 i've gotten quite a few requests for the recipe for those cinnamon rolls. although i have a preference for a more restrained product, sometimes you just gotta go with the gooiest, carbiest roll on the block, so i chose this recipe, which purports to be the clone of a popular chain brand's product. i wouldn't know about that, as i haven't had that particular roll in quite awhile. however, the recipe is quite good in a solid, no nonsense sort of way: lightly sweetened not-too-fluffy dough, with a nicely spiced innard and lots of sweet, creamy frosting on top. the only modification i did was to omit the vital wheat gluten, used a supermarket-brand yeast, and vietnamese cinnamon. also, i kneaded it by hand, and instead of putting five rolls per pan, just four for extra spready goodness. 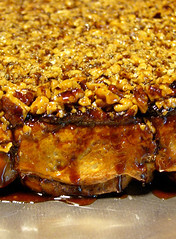 i also made a sticky buns version of it with lots and lots of chopped pecans, and a brown sugar honey sticky topping. i still used the dough from the cinnamon roll recipe, but added elise's cinnamon sticky buns topping (follow steps 4 and 5), only with roughly a third more pecans than specified. obvs the cream cheese frosting was omitted, but otherwise the recipe worked out quite well, and didn't seem overly sweet. well, you know. not for a sweet sugar sticky bun. i did intend to try and make a -cough- healthier version of this roll just for the heck of it. i bought what i thought was a ten-grain flour, along with some neufchâtel cheese, which is supposed less fatty than cream cheese (farmer's cheese is supposedly lighter as well). however, i inadvertently picked up this product, which is actually a bread mix and has yeast and other stuff thrown in. so, i followerd the directions on the label, added 1/4 cup of brown sugar, and 1 egg to the mix, and came up with a lovely, springy, multigrained sweet dough. for the filling i used the cinnamon roll recipe's filling, i used 1/2 cup brown sugar, 1 1/2 tablespoonfuls each of chinese, vietnamese, and ceylon cinnamon, and 1/2 cup of unsalted sweet butter. the mix of three cinnamons wasn't necessary, but it definitely added a more complex spicy taste--it was a little citrusy, a little peppery--that held up well against the grainier dough. that, along with the lighter creamy cheese frosting, made for a rather fine alternative for its more indulgent cousin. beat the cheese and butter together until well incorporated. add the extract, juice, and zest. beat in the sugar until fluffy. slather on top of warm cinnamon rolls. Posted by santos. This entry was posted on 20061030 at 12:46 PM You can skip to the end and leave a response. Oh for the love of all things holy and good those look amazing! If I were hit by a speeding Mac truck after eating one of those...well, I'd die happy. These look totally irreststable - I'm going to have to try them!